Sulaxshana “Sasi” Vimalan remembers the exact date her life changed. It was April 25, 2006. Sasi and her family joined the hundreds of thousands forced from their homes by Sri Lanka’s long civil war. Every day for 10 years she worried about how she would have enough food and water, let alone money to pay for medicine or other needs. It’s just one of the many burdens she’s borne while on the move or in camps for displaced people. But now, she is home again. And Catholic Relief Services, with support from the U.S. State Department’s Bureau of Population, Refugees and Migration, is helping Sasi build a new home—and her life. CRS has long supported Sri Lankan refugees in camps in India, but now, as many leave the camps to return to Sri Lanka, CRS has broadened our support to include both refugees returning from the Indian camps and internally displaced people in Sri Lanka. 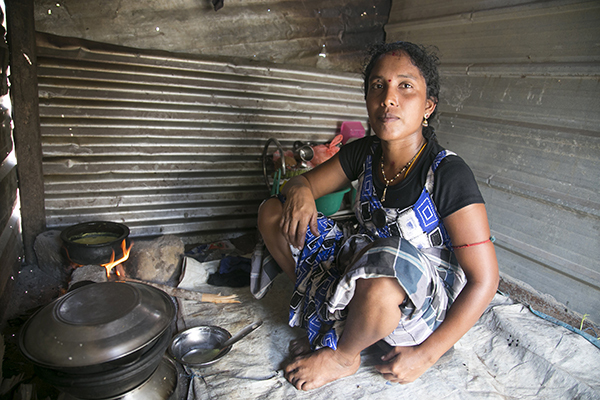 While Sasi was displaced inside Sri Lanka, her brother and other family members fled to India. The war ended in 2009, but because of the slow process of clearing mines, the Sri Lankan military did not allow anyone to return to Sasi’s community until March 2016. After that, her family rushed home. This was a far cry from Sasi’s memory of a decade before. There was sorrow because her brother had been forced to join the revolutionary forces, the Tamil Tigers, but mostly she recalls a lovely home and school with clean latrines, time for play and dreams for the future. Before April 2006, the family lived in peace, even as fighting raged elsewhere. But Sasi no longer felt safe here. Although it once was her home, now it reminded her of years on run, which included nights spent in trenches covered with camouflage cloth and in abandoned bunkers. And always, there was the worry about where to go to the bathroom. When hidden in fields and riverbeds, she had to wait for darkness. When in formal camps, she had to plan for long lines or wake in the middle of the night to use one of the few latrines. So even though she was home, Sasi was still waiting for nightfall and walking more than half a mile in darkness to use an open field. While the family had government support to rebuild a simple home, it was not enough to build a latrine. Sasi Vimalan helps her son Piritish Vimalan wash his hands. CRS stepped in with our local partner Organization for Elam Refugee Rehabilitation to build the family a latrine. Sasi finally feels safe again. “Now, I eat when I feel hungry and drink when I feel thirsty,” she says.